Remembering yet another password is the last thing your customers want to do. The Sign-In Integrations in WHMCS allow visitors to your website to sign-up faster and sign-in easier using their existing Google, Facebook or Twitter accounts. Deliver a better user experience - provide an instant and more seamless sign-in and sign-up process for your customers. Simplify logins with added convenience - many users already have a lot of logins to remember, enable them to login to your site safely and securely without adding another one to the list. Be optimised for mobile - reduce the burden of having to type on handheld devices. It's quick and easy to setup and get started with Sign-In Integrations. Read on to learn how. Sign-In Integrations: How does it work? You've probably seen it hundreds of times when browsing your favourite websites. Signing in using your social media accounts has become more and more popular as a safe and convenient way of registering and signing in to many websites. Now you can offer it for your WHMCS customer portal too. When enabled, new customers placing an order for the first time will be presented with the option to sign up using any of the enabled Sign-In providers (pictured below: new user checkout). Upon selecting any of the Sign Up buttons, the user will be redirected to their chosen Sign-In provider where they will be prompted to login and confirm that they are happy to share their details with your business. Once the user has granted your business access, the user is returned to your website to complete the checkout process where the form will be automatically pre-filled with information made available by the sign-in provider. Upon completion of checkout, a link is established between their Google, Facebook or Twitter account and their newly created customer account within your WHMCS installation enabling WHMCS to recognise the user in future. When that customer returns to your website, the login page allows them to Sign-In using the same social media account that they used when they signed up and after logging in with the chosen provider, the user will be redirected back to your website and automatically authenticated into their customer account with you. Many users leave their browsers logged into their Facebook, Google and Twitter accounts resulting in an instantaneous and seamless sign-in experience on future visits. 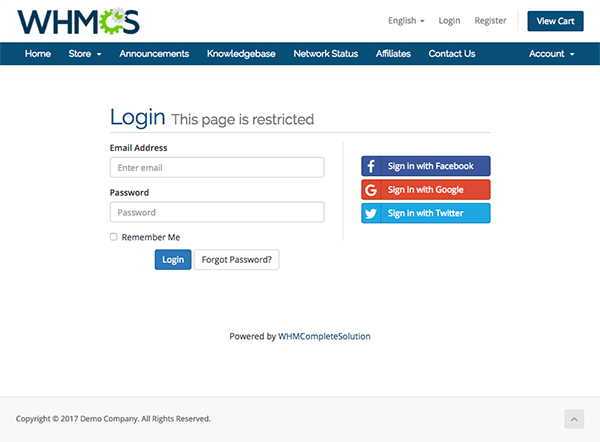 For existing customers, when they choose to login using a Sign-In provider for the first time, they will be given the option to link their Google, Facebook or Twitter account to their existing customer account within your WHMCS installation enabling them to take advantage of the faster and more convenient logins for future visits. Customers have complete control and can manage, including connecting new accounts and unlinking existing ones at any time by visiting Profile > Security Settings within the client area. It's quick and easy to get started with Sign-In Integrations. Simply login to your WHMCS admin area and navigate to Setup > Sign-In Integrations. Detailed step by step setup guides can be found for each of the supported Sign-In providers in the documentation articles below. At WHMCS, our aim is to deliver the most efficient and optimised end-user experience possible for our customers and their users. Enable Sign-In Integrations today and provide your customers with a seamless sign-up and login experience and experience an increase in your sales and customer retention. If you have any questions about this feature, we invite you to post comments below.